INFJs are known for their creativity and imagination. But sometimes, regardless of your type, you can fall into a slump or a period of “writers block” or “artists block”. There are times when I sit down with a pen and paper and my thoughts flow like water onto the page. Other times, I waste an hour just writing and re-writing the same paragraph before giving up entirely on what I’m doing. Creativity can take many forms! Perhaps you’re a creative writer, a creative performer, a musician, artist, mechanic, engineer! Maybe you’re a teacher and your creativity comes out in your lesson plans and your way of connecting with your students. What can YOU do to be inspired? What tricks can help you to keep that creativity flowing? Many times our best ideas come to us when we’re unable to act on them. For example, as soon as you’re stuck at the office you think of all the amazing things you could do when you’re at home, or as soon as you’re trying to sleep at night, your mind is barraged with questions and possibilities. Write them down! Keep a journal by your bed or in your car or work office. Writing down inspiration when it strikes is one of the best ways to jump-start your creativity! So you’re not a skilled painter… you don’t have to be! Grab some paints, some pencils, or even some crayons and scribble away. Think of it as train of consciousness art. Don’t worry about doing a good job, being accurate or literal. Play some music if that helps! Let your intuition take over! As an INFJ this can be a very freeing activity! A study done by Stanford University found that when people get outdoors in a natural environment, they transform how they view time. They feel a sense of “awe” as though time is expanding. Instead of feeling pressured, stifled, or rushed, they feel like time is in abundance. Creativity is often blocked when we feel pressured or constrained by time. Being in nature increases brain function, calms the soul, boosts your mood, and gives you the space to be creative. As an introverted intuitive, you naturally peer behind the scenes to find hidden meanings and underlying themes. Pick up a magazine and look at the advertisements…what hidden meaning are they trying to convey? In what way are the advertisements “manipulating” you? Look for symbols that stand out or small, background objects that are meant to influence you. This process of peering deeply and peeling back layers of meaning and intention can help spark creative or philosophical ideas. Our iPhones, Tablets, TVs, and computers give us endless distractions and ways to stay busy. This constant “staying busy” doesn’t give our minds the ability to wander and come up with creative connections. As introverted intuitives, INFJs get a lot of their wonderful ideas out of the blue, out of the subconscious. INFJs NEED quiet, unadulterated time to let their minds roam freely. Being glued to a screen will stifle your natural creative powers. Did you know that losing one night’s sleep is cognitively equivalent to being over the alcohol limit? This is bad news for me, because I have five kids (one of which is a newborn) and I rarely sleep anymore. So sorry if this article is very uncreative! But seriously, scientists, writers, inventors, many of them have gotten their best ideas in their sleep. For example, Stephen King wrote about how he fell asleep on a long plane flight from New York to London and had a terrifying dream about a famous writer who is captured and held hostage by a crazed fan. When he awoke, he could still hear the psychotic dialogue in his head. That snipped would go on to be Misery, one of King’s best novels. I know nightmares might not be a great persuader for getting you to sleep more. But according to a study by Wagner and colleagues, sleep allows people’s brains to mentally restructure the information they learn, resulting in new and insightful ideas and responses. Many INFJs mentioned to me that music helped them to be creative. You can easily be inspired by alternating the style of music you listen to. Many INFJs find creative or instrumental music effective at inspiring creative thought. If you’re feeling especially stuck creatively, step back from the situation and try to write down the most useless ideas you can imagine. Now use your perspective-shifting intuition to find the best features of those ideas. Even in the worst ideas, sometimes you can find hidden gems. This will not only allow you to develop your intuition, but it will help you to find unusual ideas you might have overlooked! I know this tip is a far cry from the last one, but it just goes to show that there are many diverse ways to spark your imagination. Did you know that a positive mood can facilitate creativity? Apparently, laughing boosts activity in the prefrontal cortex and anterior cingulate cortex – these are areas of the brain associated with complex cognition, decision-making, and emotion! All of this activity can help to inspire creative, imaginative thought! Do You Have Any Ideas To Add? Let us know how YOU get creative in the comments! 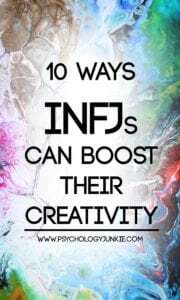 You can also find many more creativity tips in my eBook, The INFJ – Understanding the Mystic. Great ideas! I definitely enjoy switching off from technology and surrounding myself with nature. I need to get better quality sleep, that’s something I struggle with too now that I’m a mum. Great post as usual! Thanks for the insights into my crazy, exhilarating, frustrating, and perplexing personality! It has helped to pull me out of several INFJ mental funks. Your website is sort of like a medicine cabinet for my personality quirks and conditions. Love your website…it has been SO helpful as I am working on my first science fiction novel. I want my characters to be tangibly realistic, and your site has been a great starting point. I have also found many tidbits here and there while studying among your posts that have both amused me and helped me to understand myself (solid INFJ) and my husband (INTJ, ENTJ??) more thoroughly. Thanks for all of this incredible work!